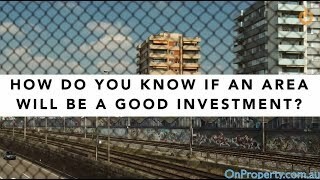 How do you know if an area will be a good investment? If you are going to be investing in a property then you want to make sure that the area that property is located in is going to be a good area to invest in. But how do you find out if it’s going to be a good area and whether it’s going to grow and have strong rental prospects in the future? How do you find all of this stuff out? Well that’s what we’re going to cover in today’s episode. First thing you need to do is define what a good investment means to you. A good investment can mean different things to different people. Some people might just want an area to have strong rental demand and rent it out for the cash flow that property generates. Other people might want that area to go up in value so that they can get capital growth on that property and don’t care about rental yield of the area. And some people might have different plans altogether. Therefore first you need to define, what does a good investment means to you and what a good area looks like to you. So a tip before we get into how to find out whether an area is going to be good or not is to look at common properties in the area. Nathan Birch of Binvested who has amassed a massive property portfolio recommends this tip. It is also backed up by Jacob from Ripe House which is an online research tool which I will tell you more about in this episode. Basically you look for properties that are the most common properties in the area. So if the majority of people are living in three bedroom houses in the area then chances are you are going to want to look at three bedroom houses in the area. If the majority of people are looking at one bedroom units then you want to lean more towards those properties. The goal is to have the majority of the market looking for properties that you have to make it easier to sell and make it easier to rent. This will hopefully make your value go up over time. In order to work out whether an area is going to be a good investment or not we need to start by looking at the key indicating factors. Key indicating factors are factors that we can look at that can signal to us long term potential growth prospects in the area. Some of the things that we want to look at include population growth in the area. You can look at census data and see 2001, 2006 and 2011. What was the population in those years and is the population of the area growing? Population decline is a red flag because if more people is moving away from the area then there is going to be more buildings than there are people. This is going to lead to a surplus and your properties are unlikely to increase in value or be able to be rented out. You also want to look for economic growth in the area and job stability because people move to areas when there’s employment in those areas. Employment doesn’t have to be directly in the suburb that you’re looking at but obviously people need to be able to find employment in the area. If people can’t find employment then they will leave and go somewhere where they can find employment. We see it happen with mining towns all the time. People move into the mining town when there is employment and as soon as the employment stops they leave the mining town and go somewhere else. The same thing happens (though not on such an extreme scale) in other areas as well. You need to look at the infrastructure investment. What is the government investing into improving that area? If you look at new roads in the area or new train links then that can signal that the area is potentially going to become more attractive to people. If they can get around more then chances are they are more likely to live in the area. You also want to look for gentrification which is the improving of the area. So what investment is being made into the streets, the general look of the area, the cafes and the commercial of the area? If you are finding that the area is slowly becoming better and better and richer people are moving into the area and doing up their properties then chances are the area is going to increase in value over time. You also want to look at walkability which is what is within walking distance from the area or what is around that area. Are their shops? Are there schools? Is there a hospital? Are there cafes? Are there things to do? What is available in the area? You can easily check that out by going to Walk Score and typing in your suburb. That will show you what is in the area. You also might want to look at some data as well. Population growth and all the stuff we talked about is data but it’s kind of a higher level of thinking and more long term. If you want to get more granular and look at data, here are some things that you can look for to indicate that the area may be in high demand and may potentially experience an increase in the near future. I use a tool called Ripe House to collect this data for me. You can check that out by going to www.onproperty.com.au/house which is my affiliate link for Ripe House. Basically at this point Ripe House is the only tool that I know of that actually collects this data and displays it in a way that makes sense to the average person. I don’t actually know of any other tools that collect this data and can show it to you so I do recommend this service. If properties are being sold quicker it is not an indicator that demand in the area is increasing. You want to look if property views are increasing. If more and more people are visiting the property listings (it may be on realestate.com.au or domain.com.au) and more people are viewing the property over time then that is a signal of more and more interest in the area. Another thing you want to look for is properties on market dropping. So if you have 100 properties on the market at any point in time and that is dropping and becoming less and less that could potentially be a signal that the demand is outstripping the supply. There are not enough new properties coming onto the market for the buyers to purchase and so properties on the market are dropping and that’s an indicator that the demand is there. You can also look at sales volume increasing. If more and more properties are being sold in the area then demand for the area can be increasing as well. You want to look at rental value increasing as well. The good thing about rental value increasing is that not only will you be able to charge more and more rents (which increases your chances of generating a positive cash flow) but rental value increasing attracts more investors into the area as well. It makes a more desirable location for investors because they are getting a better yield on their money. So if property prices are going up but rental prices are going up as well then that’s going to help support the increasing prices and drive investors into the area and hopefully improve the area even more. You also want to look for vacancy rates in the area. This means that there is high demand for people to rent into the area and you can actually rent out your property. I hope that that has helped to somewhat answer your question of how to know if an area will be a good investment. The truth of the matter is that there is no easy thing that you can just tick one box that’s going to confirm that an area will be a good investment. There is so much in the future that is out of our control and out of our knowledge. Even by looking at these data points we can’t just expect whether or not an area is going to grow. Many times RP Data Reports have said that an area is going to grow and then something happens and the area just doesn’t grow. However sometimes they say this area isn’t going to grow and then it flips on its head and it grows significantly. So it’s good to do your research but obviously research will only take you so far. If you want to find out more information about how to find and research positive cash flow properties then go and check out my free course on exactly how to do that and you can see real positive cash flow properties that I have listed as well. Go to www.onproperty.com.au/free to sign up for that course today.